It was a beautiful weekend in Cincinnati with clear skies, calm winds and a mild 70 degree temperature. Since I had not flown in over a month, I scheduled a Cessna 172 and a flight instructor. It was my first flight with Tom, a flight instructor with Co-Op Aviation based at the Blue Ash Airport. Before today's flight I had only logged 5.5 hours in the Cessna 172 so I was anxious to get some more dual instruction in this aircraft. We spent the first half of the hour in the pattern working on my landings. Since I did not fly much during the winter my landings were kind of sloppy at the beginning. After three or four trips through the pattern, the landings were getting better but no where near as smooth as I used to be able to perform them. I am going to need to continue practicing landings in the 172. Next we departed the pattern and flew north towards the practice area. We did standard procedures for an insurance or aircraft check ride. We did 45° turns, stalls and slow flight. Like the landings, it was obvious I was rusty but I improved as the flight went on and just need a little practice to get back to performing up to my standards. It was great to get back in the air today! I enjoyed flying with Tom and am going to try and schedule another flight with him soon. As I mentioned earlier, I am a little rusty having flown only a handful of hours in the past few months. 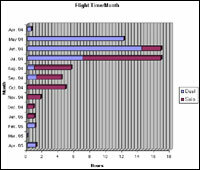 I put together a chart of my flight time since I started learning to fly. You can click on the thumbnail image to the right to see the full size graph. I really racked up the hours last fall. When I first started working towards my license I wanted to be as efficient as possible so I flew up to three times a week. I would recommend that for anyone learning to fly. After earning my license in August I flew about 5 - 6 hours per month for the next few months which was enough to stay proficient and feel comfortable in the plane. Unfortunately, as the winter came along I cut my hours back to about 1 - 2 hours per month and missing flights completely in March. I hope with the nice spring weather starting to take hold I can get back in the habit of logging between 4 - 8 hours a month. Glad you made it back into the air -- what a great day for it! I spent saturday morning at Lunken hanging out and watching the traffic. What a gorgeous day! I didn't get around to booking a plane ahead of time so I was grounded for the day, but it helps a little to read about your experience. Thanks!